When I was 9 years old a neighbor taught my twin sister and me to knit. 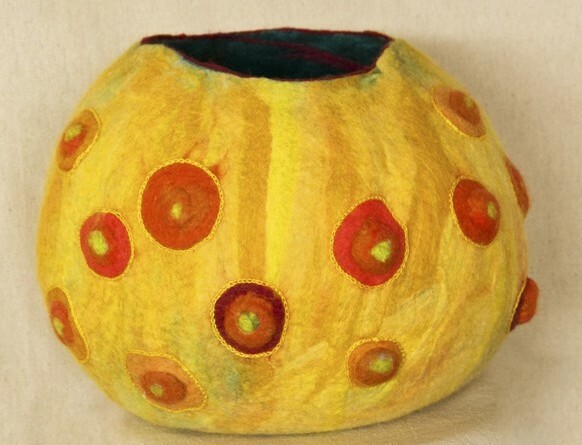 This simple act of generosity and time was my entry point into fiber arts and the beginning of my life as an artist. I was fortunate enough to attend a high school that had a fiber arts studio. It was in central Seattle in the 60s when the federal government was funding art programs in at-risk-communities to combat high drop out rates. Our school had studios for fiber arts, photography, metal-smithing, and clay. I was introduced to simple weaving techniques that captured my interest in working with structure, pattern and color. This in turn led me to take classes at a visual arts college in tapestry weaving, spinning and natural dyeing, and eventually (after marriage and 4 sons) to a BFA in textile design from Rhode Island School of Design. Through the angst and confusion of adolescence, the stresses of young motherhood and living in poverty in Appalachia, the act of first imagining and then making textile art was the continuous thread that inspired and grounded me, and gave me a sense of foundation and purpose in life. After moving to Carbondale, Colorado in 2000, I taught the Handwork program at the Waldorf School on the Roaring Fork for 9 years. In the Handwork curriculum, the children are taught to knit in first grade and each succeeding year brings a new skill and new projects — all in the textile field. There is an inherent wisdom in having every child learn how to knit, crochet, cross-stitch, sew and make their own clothes. These activities foster patience, perseverance, and a sense of competence and pride. It is a privilege to witness the beam of happiness on a child’s face when she completes a project; particularly when I know the struggles she had to overcome to do so. But of equal importance is the fact that these children are gaining a sense of how to conquer a task and manifest an object that is functional and beautiful using only their imaginations, their willpower and their hands. I am connected to the millions of woman (primarily) who have also made yarn in the past. They spun to clothe their families and keep them warm, an act of love, necessity, function and hopefully beauty as well, if time allowed. Textile arts were necessary skills for survival then and took much time, energy and patience. I spin or weave or knit out of choice, as I don’t need to make my own clothing. However I do need to create objects I consider to be beautiful for the world. I do want our children to know that they, too, have the ability to create and manifest what is stunning, necessary and good for our earth and themselves. And I hope that each generation will find the time to pass on the skills that will enrich both our inner and outer lives so that humanity has the skills and patience to think creatively and manifest change and magnificence in the world. Jill holds a BFA from the Rhode Island School of Design. 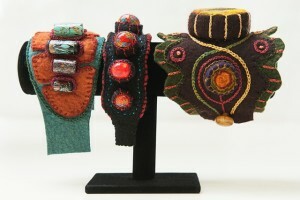 Her primary practice is as a fiber artist using felting and embellishment as her main medium. She has worked as a production hand-weaver, a textile designer for a fabric mill, and as a handwork instructor at the Waldorf School on the Roaring Fork. Beautiful article!! Thanks Jill for all you contribute to the world!! Jill… It’s always a pleasure to see what you are creating! !